Captain America: The Winter Soldier opens this Friday! Of course, in a bid to make more money, studios are commonly releasing flicks on Thursday as "Sneak Peeks". These used to play at midnight, then 10:00PM now you can see a new movie on Thursday at 7:30 or 8:00PM. We're going to the double feature of Captain America: The First Avenger followed by Winter Soldier. To celebrate, I'm wearing a Captain America shirt everyday this week. 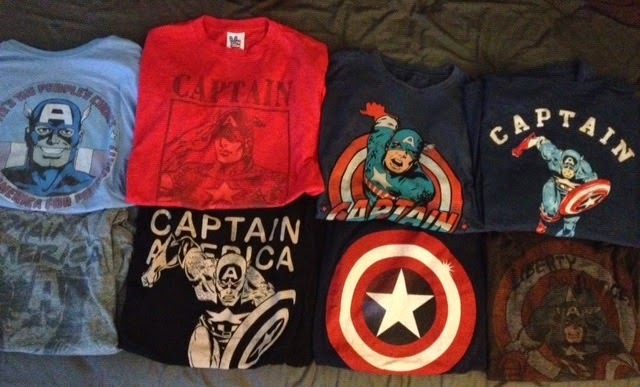 At first I fretted I wouldn't have enough but upon further inspection, yeah, I still have 8 Cap-centric shirts not even counting all of the Marvel and Avengers ones he's featured on. I've had plenty more but if the shirt don't fit, you must acquit...and go find shirts that do fit. Back in 2011, I won tickets to an early screening of First Avenger put on by Geek Chic Daily (since swallowed up by Nerdist) that took place in San Diego, during Comic-Con, with Chris Evans introducing the movie. Not a bad pre-birthday present eh? Unfortunately, even with those perfect circumstances, I didn't like Joe Johnston's (THE ROCKETEER!) First Avenger upon that initial viewing, the movie in my head from all my years of comic book reading and watching movies just couldn't make space for this. But upon subsequent 2nd and 3rd theater outings, I put that version into a drawer and enjoyed the World War II set science fiction tinged action adventure for what it was. Throw in his original triangle shield, the Red Skull, the Cosmic Cube, lots of fisticuffs, pulpy derring-do, Dum Dum Dugan and the Howling Commando's and hey, this movie is actually a pretty good time. Evans does an excellent job of playing the bumbling yet driven Steve Rogers just looking to serve his country but is physically unfit for duty. The scenes of "skinny" Steve are pretty impressive and employed a mix of body doubling and CGI to fool the audience into believing the buffed up Evans was a sickly, scrawny reject. Seemingly always in shape, Evans kicked up a notch and gained some mass for Cap as the post Vita-Ray and Super Soldier Serum injection scene showed off a beefy new version of Steve Rogers. To get in even better shape, Evans worked with the same trainer Daniel Craig had for his runs as James Bond. Looking for a big, strong and lean with a realistic, functional and proportionate body, Evans did heavy weight/low reps of basic compound moves while incorporating bodyweight and plyometric moves to keep his heart rate up. Word on the street is that Winter Soldier is going to be something special. So special that Marvel has contracted directors Anthony and Joe Russo for part III. Hopefully they don't go the route Jon Favreau did with Iron Man II and just give us more of what we liked and nothing new. But this is the new Marvel and right now they're about the smartest guys in the room so we should be fine.